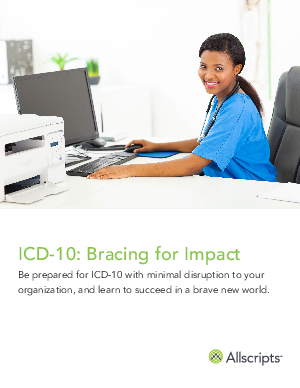 Be prepared for ICD-10 with minimal disruption to your organization, and learn to succeed in a brave new world. Allscripts Revenue Cycle Solutions provide you peace of mind with the Breadth, Depth, and Quality of our products, ensuring you are ready for whatever comes your way. In this paper, you will learn how to adapt and thrive in the new environment of ICD-10. While many healthcare organizations are bracing for the worst, we can show you how to transform the threat of ICD-10 into a new, positive revenue model to ensure your future financial growth.